I have a confession to make: In college I was a partying B student whose priorities were girls, sports and beer. Colgate University tolerated me because I wasn’t failing, and a couple of my teachers saw something in me that I didn’t see in myself. What I have since learned is that the transition from visionless, narrow-minded and average student to a top Navy SEAL, successful entrepreneur and best selling author was a simple choice – that choice was to stop being common – to dare to be someone special. That same choice is yours to make today…right now! You see, contrary to our cultural story, success in life, as measured in total joy, happiness and fulfillment, is not determined by your IQ, your bank account or what degrees and titles you rack up. No, it is determined by whether you choose to be special. Then, as your take action to be uncommon…special…you naturally evolve to take your eyes off of yourself so you can serve others. That is when the magic happens. Once the choice is made, there is no going back. You will activate an entirely new OODA loop for your life (OODA is the “Observe, Orient, Decide, Act decision process we discuss at length in Unbeatable Mind) In your new OODA loop the risk and stakes are higher than you have allowed in the past. Ultimately you have chosen to live an extraordinary life, and reject the common, suffering-filled life of your past. The decision to be special, as you certainly noted in the OODA Loop) must be followed by action. No action, then no chance of becoming special! Do not pass go, do not collect $200, just go back to common town and hope for a different result next time…which, as you know, is the definition of insanity. So once the choice is made, it is in the actions of becoming special where the rubber meets the road. The action phase of the loop is the “work” and this is where most people spend the most time and energy, and get stuck. 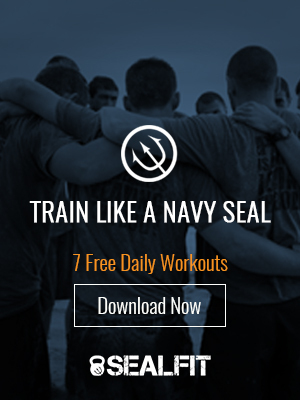 This is because each major action step (for instance starting SEALFIT training, or beginning the Unbeatable Mind morning ritual) must be followed by some period of non-action. The non-action is where you slow down and sit down to observe the impact of the action. You notice internal and external changes and how the world and those around you have shifted as a result of your actions. Then, still in the non-action stage you will orient yourself to this new information and begin to reflect upon how your next action or actions can be more powerful and get you 1% closer to your goals. This process requires that you become comfortable balancing effort and surrender. The effort is in the form of plain old hard work. The surrender is in slowing down enough to look within and find that meaning and insight for continuous improvement, alignment and surrender to the newness which is arising within you. This balance between effort and surrender can bring great joy and value to your life, and ultimately the world. One of the great ironies of our current human story is that work and effort must all be “hard.” You must join those who have uncovered the profound truth that purpose driven work is simple, joyous and balances action with non-action. In part 2 of this series I will introduce the 10 principles action steps to “Becoming Someone Special” that I plan to share with the students at Colgate University. Until then, train hard, stay safe, and make the choice.